I was driving to Oakville, and stopping at Tim Horton’s, and this bicycle store sale sign caught my attention. 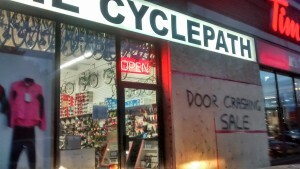 I have heard of “door crashing sales” before, but the Mississauga branch of Cyclepath were not just shooting the bull, they meant it. Due to what appears to be a serious accident, the entire front window to the right of the door was taken out, and parts of the panes separating the windows had to be cut out. And it being winter, they needed to board it up. I would say it was an actual crash, rather than a brazen attempt at attention grabbing, but when I was inside browsing I didn’t ask anyone. In the fact that they saw humor in this to spray paint that message on there, I would guess that no one was hurt. It is unclear when this sale will end, but I guess that it will be over by the time the display window is fixed.